Motorcyclists talk about finding their dream bike. What they don’t talk about is what to do once you’ve found it. The first time this usually comes up is when someone wants to purchase their first bike. “I’ve been dreaming about a XYZ1000 for years!” People jump all over them saying no, get a little bike, a starter bike. “But then I’ll just have to get the one I want later!” new person wails. Well, that’s kind of the point. Getting another one, I mean. I have some experience with that. I accidentally bought my long-term bike on the first try. It’s a great bike. It was great from day one. I fell for it hard and it’s not losing any charm or fun or anything. I have a bike that I love and fits me like a glove in every way. I don’t know that there actually is a better bike for me. So what? Well, the main problem is that I’m stuck with it. That’s an overly depressing way of looking at it, but it’s accurate. And it means that I miss out on one of the most fun parts of riding – riding all of the bikes. In fact, the only times I have managed to buy other bikes are when my long-term bike was not running. And once it was, I was right back in the saddle. I can’t stay away. When people say “don’t buy your dream bike right out of the gate,” they mean don’t limit yourself, motorcycle-wise. It also means don’t assume that what you want before you start riding is what you are going to want after you start riding. 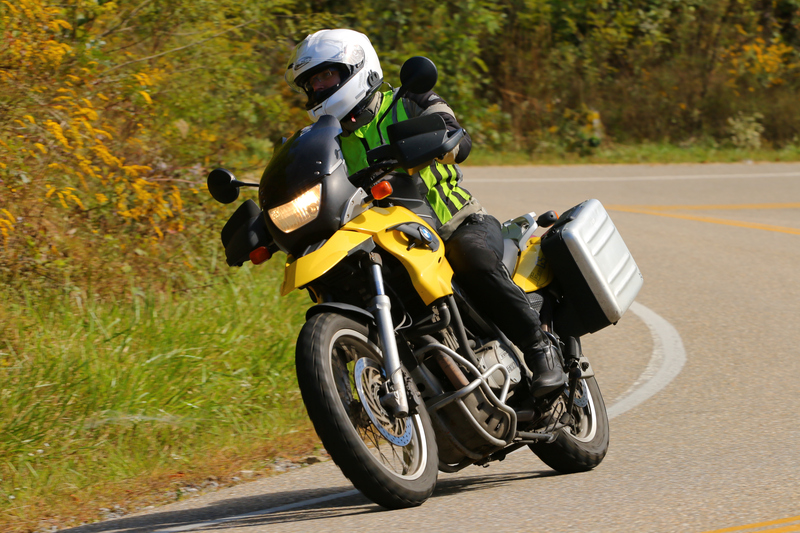 I had some conflicting wants – I wanted to ride a BMW, but I wanted to look at sport bikes. I love how sport bikes look and ride. Standards are fun (the old R65 I want is a standard), but I don’t desire them like I desire sport bikes. Then I started riding, and discovered dual sports. Oops. As much as I love sport bikes and my CBR250R was illegal levels of fun and MV Agusta exists, nothing says “let’s go hoon!” like a dual sport. Nothing says “any time is the right time” like a dual sport. And, of course, nothing says “comfy and loaded” like a BMW. So naturally logic won out and I went out and bought myself a BMW dual sport right out of the gate. Oops. Now I’m stuck. I want to try all the bikes, but it’s hard to justify it when I’ve got my right bike right here at hand already. Even worse is that now my dream bike is another one just like it, except in black. That’s right – two of them. Gotta match my outfits, you know. I still think about other bikes (I do want to collect an R65 one of these days), but none of them match up to my baby GS very favorably when it gets down to spending money. It’s a downer, I tell you. I think I need to go ride and shake it off. So if someone suggests that you hold off on your dream bike, take them seriously. Ride all of the other bikes first. Because if it really is your dream bike, you’ll never want to ride anything else, and you’ll miss out on some good motorcycling fun. Germany has a rule-based culture, and a fair chunk of life is spent figuring out how to get around the rules while still obeying them. Spirit vs letter of the law. In the US, we prize the Spirit of the Law. In Germany, it is the Letter of the Law. Once I figured this out, my life in Germany got to be fantastically easy. Just figure out how to get around the rule while creatively applying it, and you are fine. VW’s emissions control defeat programming would put the cars in compliance with the Letter of the Law, which specifies the testing conditions, while violating the Spirit of the Law, which says “don’t pollute”. I am totally guilty of this, and I think the statute of limitations is up by now. My wonderful MkIII Golf GT TDI (up top there) was not really in compliance with anything. It was low. It was leaky. Very leaky. And it sort of stopped. However, it was only a few hours of work away from passing the TÜV. Just like every other modified car in Germany – I had a procedure to get my car ready. Porous head gasket. Several cans (ok, close to a case) of engine cleaner, a lot of rags, and two toilet brushes. Over the course of several hours, I removed enough oil and coolant residue to power a small nation. I also ran the coolant mixture down to about 10% glycol. Arrive at testing station just in time so car is hot. Badly worn summer tyres. Swap on winter wheels with good snows. Same thing if I was running too-large wheels, but I wasn’t. Lame brake pads. While I was in there swapping wheels, pull off all of the calipers and rough up pads and rotors. Barely clearing the 10cm bar. Leave car up on jackstands for 24 hours and drive gently to testing station. Bring certification letters for suspension with me with setup that passes circled. I had considered removing the front valance, but this risked failing the obviousness test. When I arrived at the testing station, the car was solidly at 11cm and my coil count matched the paperwork. Braking was acceptable. I got some dirty looks for my snow tyres because it was May. I earned a comment on how clean the engine was. I noted it and realized that I should have cleaned it a week earlier to look less obvious. And the emissions check was thankfully in spec with no weirdness. I failed on a broken reflector lens. When I went back two weeks later, the lens was all they could check. So my clearly leaking (it was dripping) and obviously too low Golf was cleared for driving, because I passed the test as it was written. I feel kind of funny saying this, but the “pass the test as written” is a cultural thing. With regard to #Dieselgate, I am willing to bet all of Internal Combustion knew exactly what was up and didn’t really think it was that big of a deal, because they passed the test. Oops. I just read another useless listicle about how to survive high heels. Urgh. There is one and only one “secret” to a comfortable pair of heels (other than the “secrets” that apply to all shoewear selection) and that is heel pitch. It’s not even a secret, you can see it right there in front of you. 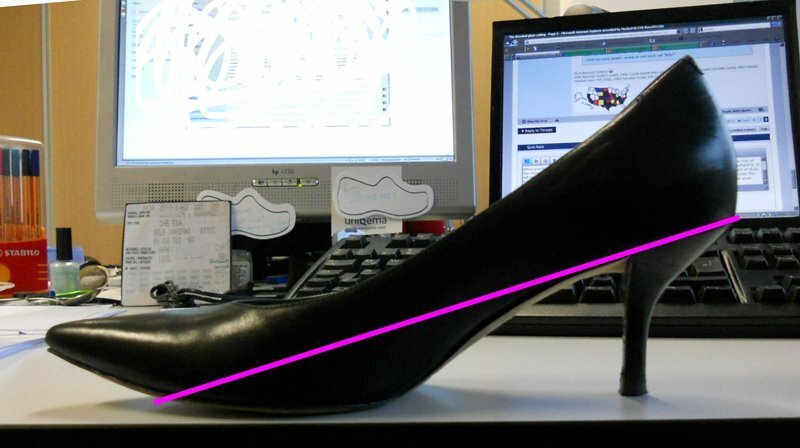 Just look at your shoe and find the top line of the heel where it meets the body of the shoe. I put a pink line on the image to show you where it is. Now that you know what heel pitch is, you can use it. See how the pink line intersects the forward sole of the shoe between the ball of the foot and the toe? That is good. That means that some of your weight will be borne by the heel. Lower heel pitch allows for a more even weight split between the heel and ball of the foot. When the line is steeper, you bear more weight on the ball of your foot. That is not good for all-day comfort. It is also not good for walking – as the heel bears little weight in a steep shoe, it is difficult to walk normally. If the shoe is designed for the heel to bear weight, you will be able to walk more normally and plunk that heel down with confidence. The only thing you need to check the heel pitch before buying a pair of shoes is a straight line to hold the shoe up to – the edge of the shoe box works great. Line it up with the top of the heel and see where it intersects the sole. Forward of the ball of the foot is better – you will be more comfortable and wear and enjoy your new shoes more.